I currently own both a 1999 M Coupe and a 1999 M Roadster. I am going to let one of these awesome vehicles go so I am comparing them in this article as a way of clarifying my thoughts. I purchased my M Coupe over 10 years ago as a 40th birthday present to myself. It has been my daily driver and I have added 65K miles to the odometer since purchasing it. 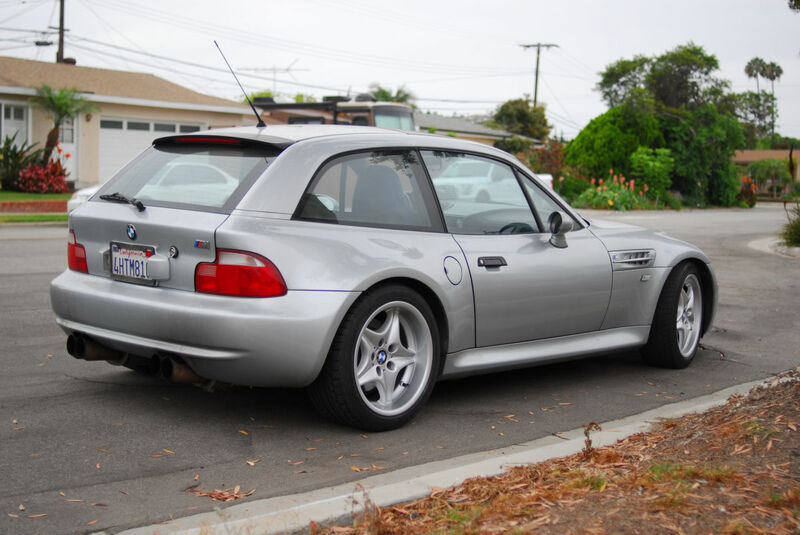 I have thoroughly enjoyed owning and driving the M Coupe. It is a sharp looking vehicle and, with the upgraded sport suspension, drives like a go-kart. The Coupe is faster than any street car needs to be. From the factory it is electronically limited to 155 MPH. Published performance specs are 0 to 60 mph in 5.4 seconds and 0 to 100 in 10.8 seconds but I’ve never done any timed trials with the car so I can’t confirm these numbers. What I can say about acceleration is that the car has a wide torque band and is geared such that it is very responsive in every gear. In the lower gears the engine quickly heads towards redline and the next shift. In 4th and 5th the engine pulls hard and the car is quickly exceeding all legal speed limits. There are two "spirited driving" aspects of this car that I especially enjoy. The first is a power down-shift from 5th to 4th at freeway speeds which results in 100 mph almost instantaneously. The second is climbing big hills on the freeway. With the torquey engine I can accelerate up a steep grade while most cars are straining just to maintain speed. There were a few times during my ownership when I considered replacing the Coupe. Every time I starting thinking along these lines I realized that the only replacement I was interested in was another Coupe. Recently, when the itch for a replacement struck again, I was surprised to find that the asking prices on Coupes had climbed dramatically in the last year or so. The low mileage Coupe that I would like to have as a replacement would cost me $30K or more while low mileage Roadsters are $20K or less. 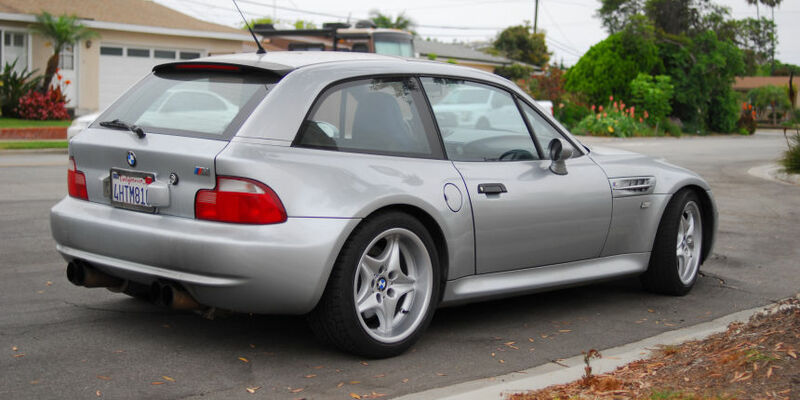 After looking at available Coupe and Roadster ads for several weeks, I decided that a Roadster with the factory hard top would be my low-buck replacement for the Coupe. I assumed that the factory hard top would make the Roadster experience very similar to the Coupe. This estoril blue 1999 M Roadster is the replacement I bought. It has the factory hard top and the dark blue soft top. A previous owner added Dinan cold air intake, throttle body and software along with AC Schnitzer exhaust and wheels. The performance upgrades add about 50 horsepower to the 240 HP factory engine. As you can see in the picture the car is gorgeous. For a 17 year old car with 74K miles it looks brand new. The Coupe has Bilstein shocks and HR springs which lowers the car 1.3 inches. With these upgrades the car runs on rails even though the suspension is 10+ years old at this point. The car handles regular bumps and road roughness just fine and the tires have never rubbed the fender wells. The Roadster has stock suspension with brand new shocks in the rear. After driving my Coupe for so long the Roadster’s suspension feels quite soft. In my Coupe I feel comfortable taking banked, sweeping ramps on the freeway at 80+ mph. These same ramps in the Roadster make me uncomfortable even at 65 mph because of body roll. The Roadster definitely needs an upgraded suspension to unleash its potential – especially with the 50 extra horsepower. This is really an apples and oranges comparison. The Roadster has 50 extra horsepower with the Dinan upgrades and AC Schnitzer exhaust but the stock suspension limits the ability to use that horsepower. The engine in the Coupe is stock but has plenty of power for spirited driving on the street or autocross track. With the upgraded suspension the Coupe is super responsive and runs on rails like a go-kart. I haven’t owned the Roadster long enough to really test its performance. Although the 50 extra horsepower in the Roadster is definitely noticeable, the stock Coupe is already so fast that it’s hard to describe the Roadster’s performance difference in any meaningful way. I’m also 10 years older than I was when I first bought the Coupe and I’m not as willing at this point to risk speeding tickets or a suspended/revoked license for “reckless” driving (over 100 mph in California). On the Roadster I hear the engine sucking large volumes of air. It is a distinctive sound that I assume comes from the Dinan cold air intake and large throttle body. The exhaust makes a low, throaty rumble that most auto enthusiasts would appreciate but it is not loud or obnoxious. The after-market mufflers on my Coupe are fairly loud so exhaust noise overwhelms all other sounds during hard acceleration. The Roadster with the hard top and the Coupe have about the same noise level at any speed over 5 mph. At low speeds the Roadster has some extra noise which I assume is the body and the hard top moving against each other. My 1999 Roadster has the lined soft top but I haven’t driven the car with the soft top in place so I can’t speak to its noise level. I have ridden in a 1998 Roadster with an unlined soft top and I was surprised by the road noise at freeway speeds. If you are new to convertibles, you should definitely evaluate road noise with whichever top you are considering before purchasing. The Coupe – what can you say? You either love or hate this body style. The Roadster with the hard top is not the Coupe but it has a similar look. And the look is definitely distinctive since there are only 10,501 Roadsters to begin with and only a few of them have the hard top. The Roadster with the hard top has a blind spot that the Coupe doesn’t have. The Coupe has rear side windows but this area is solid on the Roadster whether the soft top is up or the hard top is on. The Roadster has a small trunk. It’s certainly enough space for the groceries or two people’s luggage. From the driver’s seat both cars feel the same. The front ends are identical so the driver’s view is the same in both vehicles. The only difference in handling on my two cars is explained by the factory vs after-market sport suspension. If there is any difference in road noise between the two cars, my ear is unable to detect it. The other relevant differentiators are looks and rarity. I like the look of the Roadster with the hard top - I think it is distinctive. The Coupe has its own distinctive look. I would be hard pressed to say which look I prefer – I am used to the Coupe after 10 years but the Roadster is definitely growing on me. If I had to describe the difference to a blind person I might say that the Coupe looked like a very small station wagon while the Roadster looked like a sports car (yes, it’s a very lame comparison and almost heresy to compare the Coupe to a station wagon – please forgive me). As for rarity, there were 2858 Coupes produced in North America vs 10,501 Roadsters. Based on my comparison of the two cars I own, rarity is the only factor that justifies the $10,000 difference in market value. Given a choice between a low mileage Roadster with the factory hard top and a high mileage Coupe, I would, and obviously did, choose the Roadster but that choice will vary for each individual. The Roadster is too nice for me to use as a daily driver. It has zero door dings and only a few spots where minor paint chips have been touched-up. I’m afraid to park this beautiful car in most parking lots since the typical parking lot in southern California is sized for Smart cars and the 1950’s Mini Cooper. The blue finish on the Roadster shows dust and dirt much more than the Coupe’s silver finish. Just a few days after washing the Roadster I can see a layer of dust on it while the silver Coupe can go weeks without needing a bath. 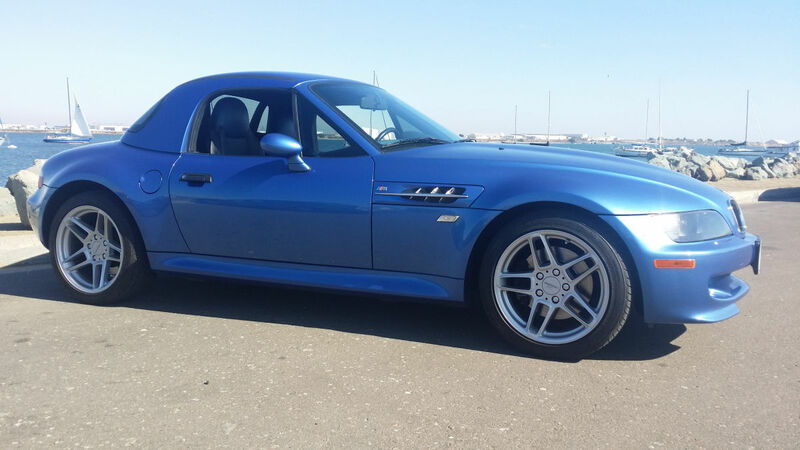 When I listed the M Coupe for sale, Daniel N was one of the people who expressed interest. Daniel restores M Coupes and Roadsters and writes a lot of the articles you will find here on Jon’s website. After conferring with him, I decided to let him restore my Coupe instead of selling it as-is. Daniel will be posting some pictures and details about this restoration in coming weeks. The Roadster is currently for sale. You can view the listing here. If the Roadster sells before the Coupe restoration is complete, my decision will be made for me and I will keep the Coupe. If I still have the Roadster when the Coupe is done, I will probably let Daniel upgrade the Roadster’s suspension and add that cost to my asking price.